A Chicago design firm was designing a printed marketing piece for a large commercial development along the I-88 expressway corridor, west of Chicago, near the Morton Arboretum. The marketing piece was to be used by the real estate brokers to attract large corporate clients to locate in the new “Corporetum” development as anchor tenants. 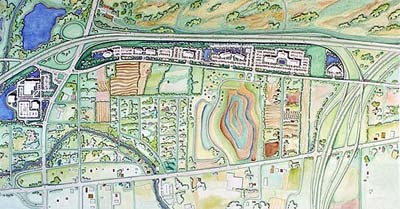 Randal Birkey created a master plan map illustration of the development working from architectural and engineering drawings, and aerial photos. The line and watercolor style illustration was scanned and used as a center gatefold in the four-color printed piece.